Review two products heavy equipment fitness barbell at the gym between Bowflex 552 vs. below 560 is a great thing to know and not to be missed especially for all of you who are planning on starting a fitness sports in the gym favorite to build muscle so have a large, burly, muscular and athletic certainly. Start by selecting the best according to your barbell. We recommend that you first read the following review to avoid mistakes in the election. Bowflex SelectTech 560 Dumbbells can be supported you with more than 30 strength exercises for the upper body, core, and a free app with video guidance plus 6 weeks of daily workouts which are available for users using devices with iOS 7.1 or higher. Strength coaching is provided for those who are from novices to advanced athletes. Bowflex SelectTech 560 Dumbbells have 16 weight settings ranging from 5 to 60 pounds for helping ensure that people in a variety of fitness levels can choose light resistance for toning even heavier resistance to build bulk. The settings on Bowflex 560 Dumbbells are: 5, 7.5, 10, 12.5, 15, 17.5, 20, 22.5, 25, 30, 35, 40, 45, 50, 55 and 60 pounds. For more challenge, you can try the SelectTech 1090 set instead. Bluetooth technology helps ensure that you’re using proper form for strength training. It also tracks the weight used and can count reps and sets. Bowflex SelectTech Dumbbells can export data to a wireless app for easy tracking. Bowflex SelectTech 552 Dumbbells provide resistance levels from 5 pounds to 52.5 pounds of weight, meaning they replace 30 different dumbbell weights all in 2 pieces. This makes it easy to start out slow, and gradually adjust workouts in 2.5 pound increments until you achieve your desired strengthening weight. For most exercises done with proper form, 52 lbs. in each hand is more than enough, which is why I chose to buy the 552’s instead of the SelectTech 1090 set. The dumbbells come with a free Bowflex SelectTech workout DVD for exercises routines you can watch and follow. The “Secrets of the 4-step Rep” provides you with a great strength building workout and gets you on your way to maintaining your ideal weight. Over 30 exercises are included with the 552 dumbbells, with over 80 variations to keep you from getting bored. The best feature of Bowflex SelectTech 552 Dumbbells is that they save so much space, while still providing you with a complete strengthening workout. 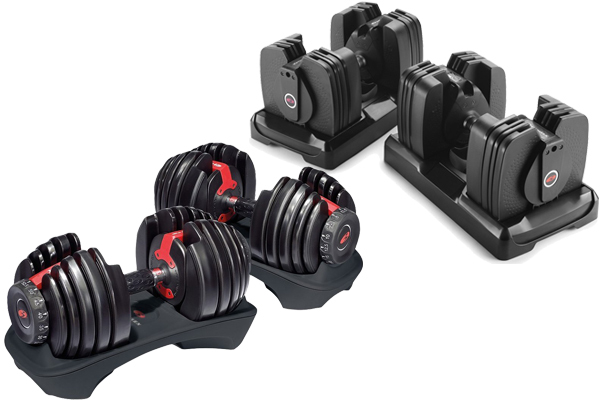 Because you are using one set of dumbbells rather than 15 sets you can easily fit the Bowflex SelectTech 552 Dumbbells in any corner of your house or apartment. According to price, design, and features among Bowflex 560 vs 552, we prefer more with Bowflex 552 especially for you as a beginner, but there is nothing wrong to go with Bowflex 560 if you already become a professional one and really want to upgrade your fitness tools instead of a barbel which is one of the most important thing for your fitness life. Benefit of choosing Bowflex 552 also is on the cost which is much cheaper than Bowflex 560.